Jealousy! Why do people get jealous? The cure for jealousy: think of others! Jealousy is a form of pride, because you feel someone is treating you unfairly and you're being mistreated and abused. So jealousy is really a spirit of complaint and murmuring which is, of course, born of pride. YOU MURMUR BECAUSE YOU FEEL LIKE YOU DESERVE TO BE TREATED BETTER. You're being mistreated. You're being abused. You don't deserve it. You're better than that. "I deserve to have him all to myself! SHE doesn't deserve to have him at ALL! I am the one that ought to be considered. I am the one that ought to get the attention. Nobody else deserves him but ME!" That's pride! That's jealousy! Selfishness is pride! What IS selfishness after all but PRIDE? The SELFISH believe THEY deserve MORE than others. Therefore they're unwilling to SHARE. THEY feel like THEY'VE got a right to it ALL. NOBODY else deserves to have ANY.--And they get angry if anyone even SUGGESTS they ought to SHARE! 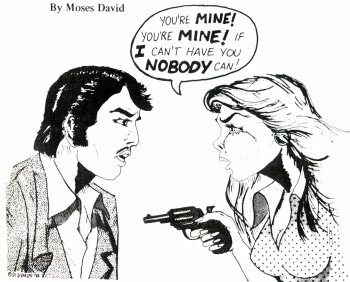 Selfishness is the possessiveness of private property.--"It is mine!--Nobody else's! I deserve it and nobody else can have it! I'm the only one that has a right to it!" But the truth is that he belongs to OTHERS as well as YOU--his time, his attention, his thoughts and counsel. Watch out!--The Lord might take him away and then you'd HAVE NOTHING to murmur about, complain about or get hateful about! You can become like a dog in the manger where YOU don't want him, but you don't want anybody ELSE to have him either--and you'll LOSE EVERYTHING! Foolish, selfish and jealous people!--Do you know what they're willing to do? They're willing to even kill the thing they pretend to love just to keep it away from OTHERS, just so nobody ELSE can have it! They would rather see it DIE than have anybody ELSE have it! They'd rather kill it than share it--that's the ultimate in selfishness, like those women in the Bible: That's the way Solomon found out who REALLY LOVED the baby! The one who REALLY loved it was the one who was willing to GIVE IT UP to preserve its life so that at least the baby could be happy and live.--1Kings 3:16-28. The one that didn't love and wasn't the true mother didn't really care about the baby, only HERSELF, and would rather KILL the baby than let anybody ELSE have it! So the proud, selfish and jealous KILL rather than let anybody else have it--which shows and PROVES they DON'T REALLY LOVE IT. They really only love themselves! That's the ultimate in JEALOUSY. That's what women do when they murmur against others to whom he pays attention and complain he doesn't love THEM just because he deals with OTHERS. It's just like sticking a knife in his back and making him want to die! You think he's hurting you. But if he LOVES you and is only trying to HELP somebody else, that's the furthest thing from his mind. If he loves YOU and he loves the LORD, he'll also love OTHERS and want to help THEM, too. The same goes for the FELLOWS, also, who are jealous of their WIVES! In the long run, you won't kill your competition--you'll kill the one you say you love!--You may kill his LOVE for you, his FAITH in you and even his faith in HIMSELF! It's a common practice with the Lord: People who are not willing to SHARE what they have, God often takes it away COMPLETELY and many times gives it to the one with whom they were NOT willing to share it! By your selfishness you could be absolutely killing the one you say you love! You know what God did with the Israelites when they refused to give a tenth?--He took the WHOLE THING! The only thing that will HELP you will be to HURT you. "Unto him that hath, shall it be given, but unto him that hath not, it shall be taken away, even that which he thinketh he hath!" THE BOTTLE ASKS ONLY TO BE CONSUMED, never to be replenished. Also see on Deep Truths: Jealousy: The Green-Eyed Monster!